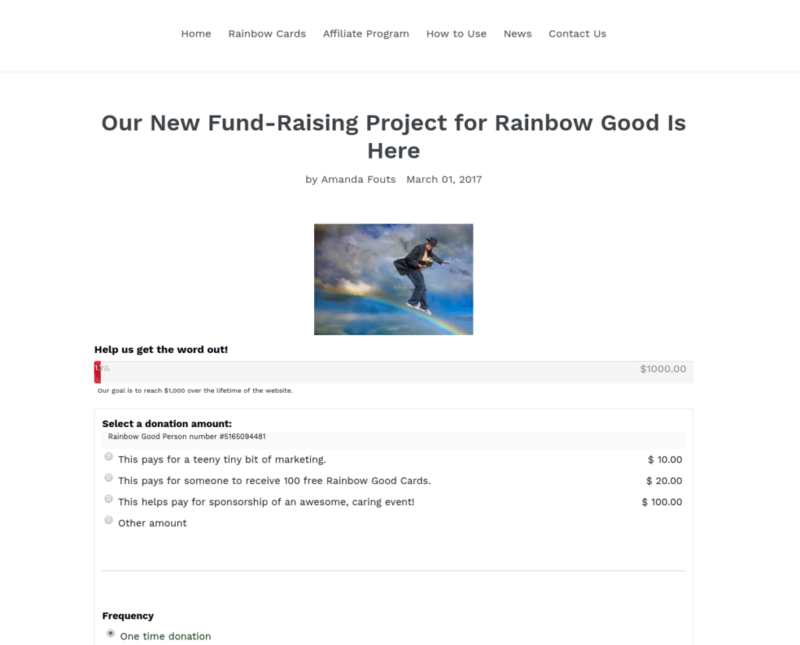 Rainbow Funding’s newest project includes donation levels set at $10 (Marketing), $20 (Pays for someone to receive 100 Rainbow Good Cards), and finally $100 (Helps someone sponsor a caring event). Users have a choice of either one time or recurring donations. 1) Register on our site for a free account number. 2) Purchase the 100 free Rainbow Good cards with the discount code. Pay only a small amount for shipping and handing. 3) Be sure to check the box requesting your account number to be printed on the cards. 4) Receive your cards within 10 days. 5) Start your fundraiser, event, crowdfunding session. 6) Hand out your cards to donors without cash who can donate to your cause or product launch through our website. What Charity Types Are These Cards For?